These griddled courgettes are bursting with summer flavours, and taste fantastic whether served alone or with grilled meat or fish. Preheat the barbecue or heat a griddle pan to hot. Cut the courgettes into 5mm slices lengthways and place in a large bowl with the garlic and half of the olive oil. Toss gently to coat. 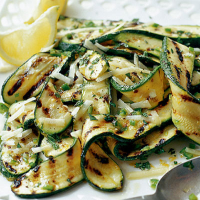 Place the courgette slices on the barbecue or griddle pan and cook for 5 minutes until tender and charred. Remove to a serving plate and scatter with the lemon zest and juice and chopped chilli. Drizzle with the remaining olive oil and leave to cool and marinate. Before serving, scatter with the Parmigiano Reggiano, mint and season to taste. This salad also works really well with finely sliced fennel. Try extra virgin cold pressed rapeseed oil as an alternative to olive oil, it tastes great - and it's British! A rosé is ideal for outdoor drinking.